Bristol Centre Mall is one of the stranger and more forgotten malls we’ve found in New England. Located in the downtown area of Bristol, Connecticut, an old, sprawling, blue-collar city about 20 minutes southwest of Hartford, it has almost no national chain stores and has very little internet presence–it’s even snubbed by the International Council of Shopping Centers, despite being plenty large enough! DeadMalls is one of the only places to find historical information on this strangely charming mall. It was very visibly structured in the 1960s, and a visit to the site makes it very obvious that a large swath of the center of their downtown was demolished to make room for this beast. Located very, very far off of major highways and not even located on a state route at all (though it is close to three), this center is so poorly-located that I wouldn’t be surprised if residents of surrounding towns are even unaware it exists. By and large, it’s a relatively straightforward, small dumbell mall that’s typical of its vintage–complete with blonde brickwork and lime green details on the exterior–but Bristol Centre Mall is interesting for a few reasons. First of all, there are several very, very old local storefronts (including a really groovy looking restaurant) that appear to have been fixtures for decades. Also, the anchor store at the northern end of the Bristol Centre–the former “The Grand,” later Sears Outlet space–has a rather irregular border with the mall, facing it at a jagged diagonal that gives great visibility into the old space. 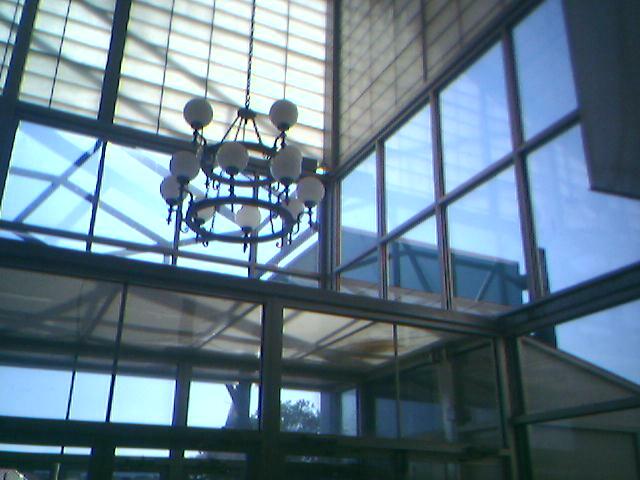 Another favorite is the tall, glassy access hallway next to this large anchor seen in the picture at the top of this post. While it’s a bit worse for the wear, it symbolizes the kind of optimism and grandiosity that architects used to design into even smaller malls like this one. Newer malls just don’t have the same gravitas. Interestingly, on my first visit in 1999, I can recall that Styx‘ mid-seventies lite-rock abortion “Babe” was blaring through the corridors, and I still associate that relic with this relic. Music, retail, and roadtrips are all intertwined for me, though mercifully not usually in such a dreadful (albeit amusing) manner. 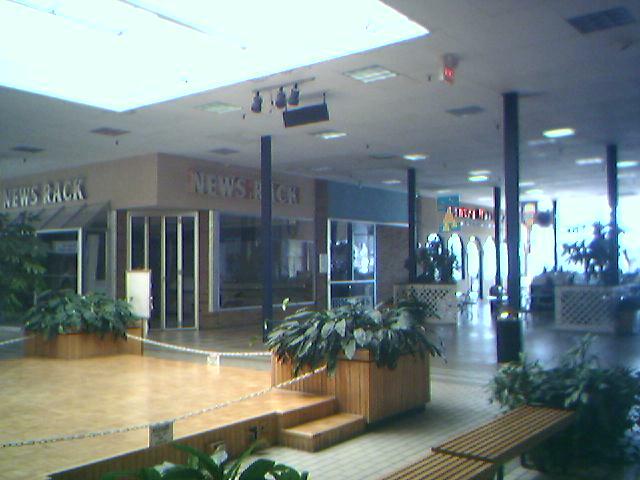 Today, the Grand/Sears Outlet space is vacant, and Bristol Centre’s other anchor–which was a Raphael’s when it was built but later became a Sage-Allen store–is occupied by Ocean State Job Lot, one of New England’s favorite retail cockroaches. EDIT 6/29/2006: In the month since I initially made this post, a lot has gone on at the Bristol Centre Mall (more, frankly, than in the seven years separating my first visit and when I took all these photos). 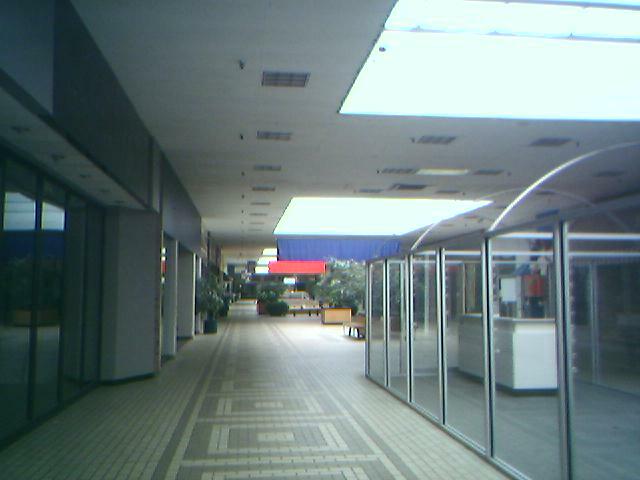 The mall was bought by the city in late 2005, and most of the tenants were forced out. This caused Ocean State Job Lot, who is the mall’s main tenant, to actually sue the city because they did not want to leave. They even registered the domain name at www.bristolcentremall.com, which is already showing up as a Network Solutions dummy page. Check out the Google cache if you want to see what was there. Perhaps most interesting of all is this set of photos, posted by one of our readers (see the comments to this post to see what he had to say). They were all taken on June 15, 2006. According to this article in the Bristol Press, the mall’s final days are now near, and the Bristol Centre Mall redevelopment is imminent. All pictures on this page were taken September 2, 2005. The website above is a link to my photo album of the mall. All were taken on Thursday June 15, 2006. All tenants are gone from the mall except for Centre Mall Pizza which is moving across the street in July or August and Ocean State Job Lot, which is suing the city of Bristol. As soon as the lawsuit is settled the city of Bristol will demolish the mall and sell the property to privatre developers. What an excellent collection of photos! Thanks for sharing them Marc; they really shed a lot of light on how much has changed at this mall in a relatively short period of time. 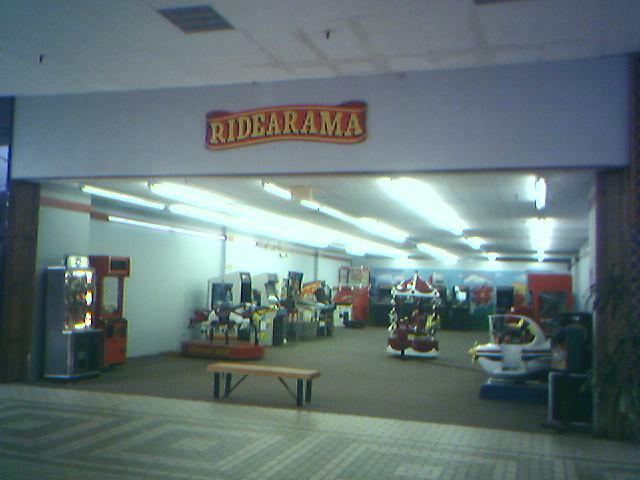 I first “found” (and I use that term because it’s pretty well hidden and was not terribly well advertised) the Centre Mall in the summer of 1999, and last visited in early September 2005, which is when all of my pictures were taken. Very very little changed at this mall in that six year period, but it seems that quite a bit has happened since I was last there only nine months ago. It doesn’t seem that the Centre Mall is really one to mourn; it’s relatively unadorned and the circumstances of its development are depressing (city centers should never be demolished wholesale), but it is always sad when any major entity like this passes. Marc, thanks for stopping by and I hope you continue to keep us apprised of developments at this mall and others in Connecticut! We appreciate it! Where this mall is now used to be a city street full of historic buildings. Anyway good pics, what makes this mall rare is the fact that it is single-floored and in a town square-type style. I’ve been in their one summer and observed the brick walkways were fake and were like textured plastic floors, and they were slightly losing their shape at that time. Another interesting fact is that this was built in 1969 the same year the Naugatuck Valley Mall was built in Waterbury. 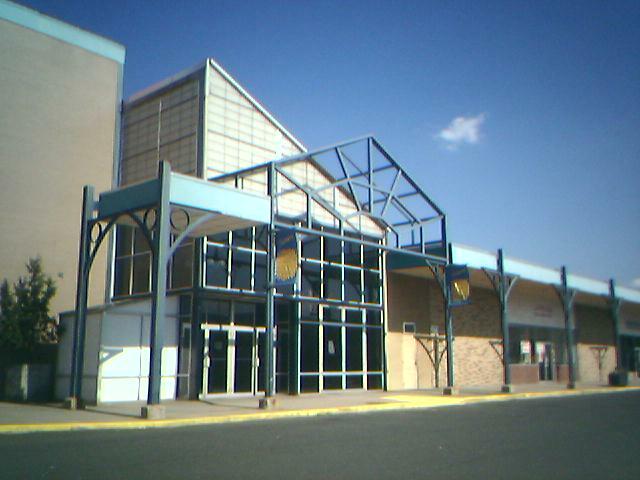 The Naugatuck Valley mall had a similar style except it was red-brick color schemed, much larger and had fountains and false-shingled type roof over each store. That mall was anchored by Sears and G.Fox. and outside it also had a Sears/Midas gas station/auto parts store. Its demolished now with a shopping center as a replacement in its space. I can more info on the Naugatuck Valley Mall if your interested. I wonder if people can still remember shopping at that mall. 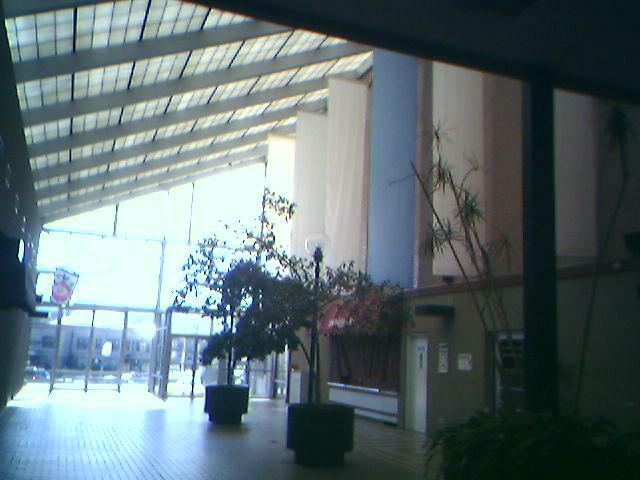 @Mark, I do remember Naugatuck valley mall, I remember Fox’s and McCory’s, the fountains were fun to throw coins in. There was an ice cream shop there that my mom used to take us kids to. Have some nice memories of that mall. Am wondering if you remember the Farmington Valley mall in Simsbury? It had Bradless, Sage Allen, and D&L, and several others. Probably built around the same time as Bristol and Naugatuck malls. Nice photos of Bristol Centre mall. Thank you for sharing. I think I came here on a rainy day back in 2001. Wasn’t there a store that served as a flea market or something? I just remmeber coming out of a Job Lot , going into an atrium wing and going into a long narrow shop full of different vendors. Am I thinking of the right place? Oh, and ‘Mark’ post all you have about the Naugatuck Valley Mall. I used to go there alot living in Southington and all. I just remember a dimly lit mall with shingled tudor style storefronts and a red-brick floor. Though, I have fonder memories of the ToysRUs that used to be across the street. also, the mall parking lot covers a decent size river. bristol is the only place i know where a river runs through the center of town, but under the town. very sad really, i wish it could be uncovered. and skruffylook, yup, that’s the place. The fact that this place closed earlier on Saturday than Monday through Friday speaks volumes. Was that to keep the knife fights to a minimum? I grew up in this mall!! My mother was the manager of “Showcase Cards & Gifts” a local chain that was incorporated by American Greetings out of Cleveland Ohio to settle debts from the original owners. This became the retail division of American Greetings, Carlton Cards Retail Inc which she and now I still work for to this day. The store was located right in the center facing the main street, it was across from the News Rack and in the center there was an ice cream kiosk. In the picture above of the center court wooden stage we would be on the other side. We were characterized with floor to ceiling plate glass windows with our trademark American Greetings Rose logo in a decalled pattern across the windows. The interior of the store was done in 60’s-70’s era wood slatting over floor to ceiling carpeted walls. 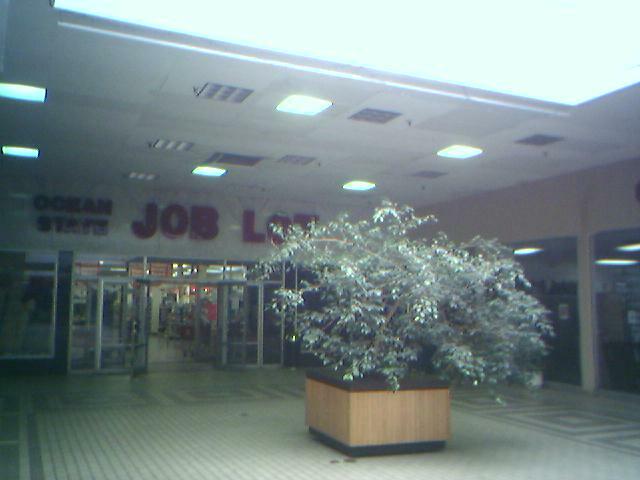 This store had a large regular customer base and didn’t decline until the building of the Brass Mill Center Mall in Waterbury and my mom and her staff went into the newer location. They closed the location the christmas after moving into the newer mall. As I recall this was the dagger in the heart of the mall as the management team left the mall to go to work for GGP thus leaving the mall without management or direction. I believe after we left a chinese buffet renovated our space and then it became a flea market. I spent every sunday in this mall and there was an every body knows everybody relationship in this mall that you just don’t see today in the larger malls. My mother jokes about me assisting customers at age 7 find cards. It’s sad to see them tear down my childhood but from a trip to Bristol a week ago the mall is still standing due to a legal battle over the funds to demolish the mall. I worked at Showcase Cards & Gifts, first as a cashier and for a short time I was Assistant Manager (approx. 1990 – 1992). My managers name was Judy. Is she your mom? What happened to all the Good stuff they were going to put in place of the mall. Swingpool, Parking for the city, ect. Roland was going to do so much for the city LOLLOLLOLLOL !!!!!!! Look what happened ????? I am glad Ocean State is giving them a hard time. I hope they keep it up. Well, They got Ocean State out now what ???? They going to tare it down so they can grow more weeds like across from the Bank on rt 6. Looks good for the town. I like it when they make there own BLITE. Mall Demolition Party 9AM 1/7/08. My grandmother used to own the icecream company… I believe it was Victoria’s Cone. I used to come to this mall all the time when I wasn’t even a teenager. I loved this mall. I was talking with friends about the mall when it first opened , and we can not remember what the name of the store that was first there where Sears was, I can remember it but can’t remember the name. What fond memories I have of the mall. The demolition of this mall has begun. Mer you said “we can not remember what the name of the store that was first there where Sears was, I can remember it but can’t remember the name” It was W.T. Grant wasn’t it ? Well did the Mayor plant the weeds there yet. or are they going to do something there? Mar, The 2 story anchor store closest to the Grocery store (formally FINAST) was originally named Grand Way. My grandparents and I shopped there many times as a kid. The toys were on the 2nd floor at the top of the escalator. It was the last store standing. The crews took down what was left of it today. I lived in Bristol, CT from 1994 until we moved to TN in 1999. 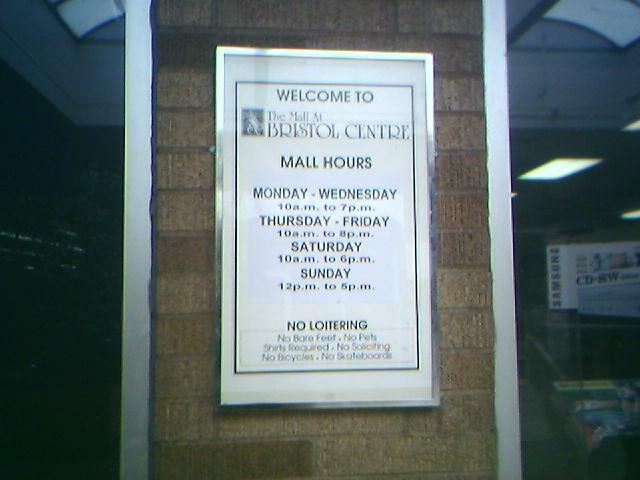 We very rarely went to the Bristol Center Mall. Mostly we would head to Westfarms, Meriden Mall, or even Holyoke Mall up in Mass. I guess we were snobs, lol! I was just a kid/teenager though..I went where my parents did! I do remember that I won 2nd place in an art contest for the Carousel Musuem (would have been 1st if I’d had time to paint in a pole! My teacher rushed us though..) and our ceremony was at Bristol Center Mall! It was embarrassing for me as I was SHY and didn’t want to be there, but we did go to Ocean State Joblot afterwards and buy a bunch of pogs, lol! I keep meaning to get back to Bristol to visit some friend there, but life’s keeping me busy down here in TN!! I lived in forestville until 1979. My sisters and I all worked at Dorothy’s, a small womans clothing store next door to Raphield’s. It was my first job back in 1976 at which I was paid below the minimum wage. They used to have mens night a couple nights before christmas every year when only men were allowed to shop there. It was always packed that night. There was a tall mens shop next door too. Can’t remember the name of it though. 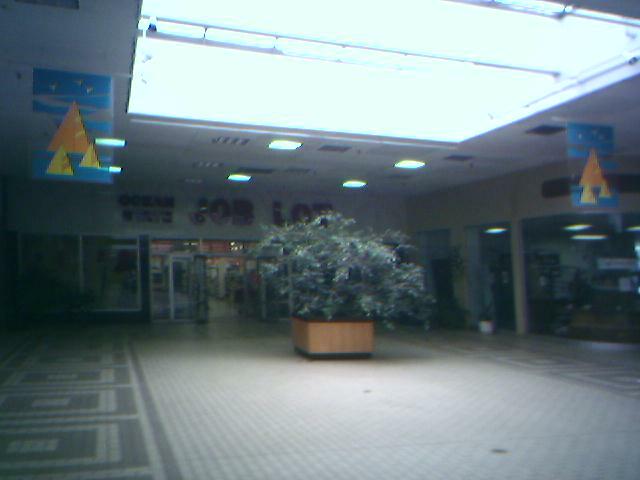 The mall was always a little spooky to me. I remember it being so empty and quiet most of the time. It echoed as you walked down the corridor from shop to shop. The card shop was owned by my parent’s friends originally. I think that shop was more of an anchor than the two stores on either end. They seemed to have a steady flow of customers in and out on a regular basis. I hope they do something with the land there that would serve all of Bristol’s residents. and perhaps capture some of the original history of the town. I came across this mall in 2007 as I went to Bristol for a job interview. I had to take the bus to Bristol from Hartford, which is quite a treck because a highway doesn’t run by Bristol. Rather, to get to Bristol from Hartford, you need to go to New Britain by bus and transfer to another bus line that ends at the Bristol Mall (although on the map, it was labeled as “Bristol McDonalds”). Another option is to go from Hartford to Unionville and transfer to the Bristol local bus, which circles what used to be the mall. Anyway, after the interview I was hungry and walked to the mall, thinking it would be occupied and I’d be able to get a slice of pizza or some Chinese before taking the bus back to Hartford. But, no such luck. From a distance, the mall still looked like it was operating and the parking lot — in spite of the cracks and shifts in the pavement — was in use. When I got up close to the mall, however, all I saw was a ton of graffiti. If Bristol were closer to Hartford and had other ways of transit to get there (aside from taking two really long bus rides that show you south Hartford, Newington, New Britain, and Plainville before stopping in Bristol), maybe more people would have gone. Both Buckland Hills and Westfarms have several bus routes going to them, which attracts people from both Hartford and New Britain who don’t have cars. Quite frankly, I’m not too fond of Westfarms because almost everything is upscale inside the mall, there is no food court, no proper bookstore inside the mall, and all of the stores worth going to are located in the strip malls following the enclosed mall. Not ever going inside Bristol Center Mall (I didn’t move to Hartford until 2006), I don’t know if the mall had much in it (although the pizza place that moved across the street serves pretty good food), but certainly, if you can get reasonably priced clothes and books and stop at a food court, the mall must not be that bad. After reading the article, I wondered, wouldn’t it have made so much more sense to just keep the existing mall there and just clean it up, keep the businesses there, and perhaps add a few more businesses? Bristol isn’t an upscale community and a “Blue Back Square” in the middle of the city would fail miserably. What is so wrong about a shopping center geared toward the community that surrounds it? And, why would people in West Hartford make the trip to go to Bristol to go shopping when they have Westfarms, West Hartford Center, and Blueback Square? I think that’s it’s terrible how they tore it down, reading all these comments, it just makes me so sad that they would just tear down a part of history like that. My grandmother & I used to go there alot, also. I mean they could have just added new, more popular stores. Such as, Hot Topic, or Hollister, or Yankee Candle. Anything really would do. I mean there’s alot of kids in Bristol & even that live around Bristol that would be there probably everyday haha. But still, I just wish they would have made a better choice on what to do with it. Olivia, they can’t just put better stores there. The stores have to WANT to open there and none did becuase of the poor history and location. Ive grown up in Bristol my entire lief, and my very first job ever was at Sears outlet in that mall when i was 16. That place should have never even been considered a mall. It was a low life/homeless/poor people hang out. @Catheirne, So very right, it will take another 20 years before anything happens. I do know that Christmas tree shops was to go to the old mall site and a few others, but the then mayor wanted to much taxes from the business’s and they backed out. The empty lot at the old mall is a scar on the downtown area of Bristol. Something should be done. Supposedly a developer has purchased the land will start something in spring of 2011, but that shall remain to be seen. I worked for the Owner of the Mall between 1990 and 1993. During that time both Anchor Tenants (on opposite sides of the mall) closed down. That was Sears and Sage Allen. Without a large drawing tenant at either end of the Mall – the small stores in between really suffered. I believe that the Job Lots store – moved in after some time. I left my job there shortly thereafter. I always wondered what happened to the Mall ( I have always lived in the Greater NYC area – and only visited Bristol – and the Mall itself once – when I was leaving that job). Sad to read that the place is now gone. Well, Now June 2012 ” Weeds” are still growing I see. Just like across from the bank on rt. 6 NICE isn’t it…………. the mall is now long gone and knocked down. i’m sad. I lived in Bristol from 1969 to 1985. The mall originally had stores like GrandWay, Raphael’s (which later became Sage-Allen), Dorothy’s, Raymonds, Deb Shop, Cassin’s Shoe Tree, Michaels Jewelers, Cercone’s Smoke Shop, a nail salon (acrylic nails were a new fad back then, and a host of other small locally owned stores, including a large drug store which I believe eventually became a card shop. 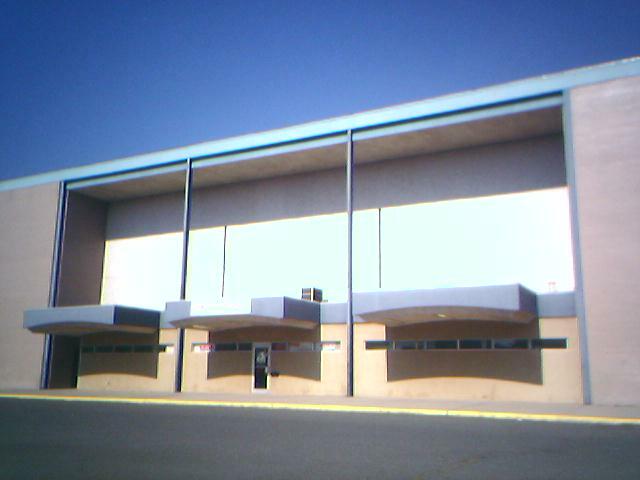 The mall was, as some have pointed out, a large ark type of building, usually void of customers and when walking throughout, echoed like a large cement vault. It was the only other place to shop in Bristol besides the Hub-6 Plaza or the Bristol Plaza which had locally owned and regional chain stores. There were other shopping venues, such as Bishop’s Corner and Corbins Corner in West Hartford, but I don’t know of many Bristol residents who ventured there to shop. I remember more impressive malls such as the Naugatuck Valley Mall and the Farmington Valley Mall which were the next “step up” in shopping, all with their classic late 1960’s early 1970’s motif. Marshalls was on Route 44 in Farmington back then (and still exists today). The concept of discount fashion shopping that Marshalls offered was a huge curiosity and major success. Oh, and there was also Loehman’s in Farmington, too. (Upscale discount shopping). Then came WestFarms in the mid 1970’s which was a huge venue for everyone to make a day of shopping in a gorgeous upscale mall. It is still outstanding today. Bristol was, and still is, a city which never grew to meet the needs of the next generation because there are no major roads that lead to or away from its central areas. The debate about major route planning through Bristol has gone on for decades. A few years ago, I drove through the area that the new extension of Route 72 leads to (horribly depressing Riverside drive) and wonder what the town planners are thinking. After almost 40 years of debate as to what to do about Bristol’s image and expansion problem, the only thing they could come up with was ending Route 72 in a depressing area such as Riverside drive? Bristol Centre Mall was probably glad to see the wrecking ball after decades of struggling to survive in a poorly chosen area for its beginning so many years ago. I have not lived in Bristol for many years (since 1956, to be exact). I am still mourning the beautiful side of Main Street that was destroyed by this monstrosity. If only the “urban renewal” fad had ended a bit sooner, Bristol would still have a whole historic Main Street instead of half a one! @Peg Casey Walz, I absolutely agree! The Center Mall was a disaster from Day 1. They demolished a beautiful post office and other charming small town structures to provide room for this failure. Bristol was never much, but this destruction made it nothing. Does anyone remember a store in the mall called Lenore’s?